to the increased acceptance and full implementation of palliative care around the world. I first of all thank Georgetown University in Washington DC, represented here by Doctor John Borelli, then Georgetown University in Qatar, represented by Dean Ahmad Dallal, and I thank Sultana Afdhal, Chief Executive Officer of the World Innovation Summit for Health (WISH) Community sponsored Qatar Foundation. Their contributions to the scientific and organizational aspects of this event have been invaluable. It is an honor to collaborate with such prestigious and culturally committed institutions. Historically, the palliative care movement was born at the middle of the last century to give specific medical and social attention to incurable cancer patients and relieve the complex of symptoms that accompany the most advanced stages of the disease until death. From the beginning, palliative care includes not only the management of symptoms and care for the needs of the patient, but also preparation for death, in the realization that it is not only inevitable for all, but that it must be dealt with in particular ways when a disease is incurable and the progression to death is unstoppable. Palliative care also includes the patient’s family, or those others who are closest, as beneficiaries of accompaniment. We are aware of the importance that palliative care can assume, inside and outside medicine, in times like ours where we witness marginalization, discrimination, and the elimination of the weakest of human beings, such as those suffering from a serious, disabling or incurable disease. We want to oppose the “throw-away culture”— and we know how pervasive it is in most of contemporary society – by promoting a “palliative care culture,” that overcomes the attraction of euthanasia and assisted suicide, and that leads to the greatest possible acceptance of a culture of care that enables us to accompany the dying with love until the end. To accomplishing this, I think we must reflect as deeply as possible about the great anthropological questions and enormous ethical challenges we face in dealing with the end of earthly life. For this reason, our efforts in this Conference will be directed to exploring what palliative care can offer to those human needs that arise from the power of the human spirit. We will take consider not only clinical experience, but also the contributions that science and the deathless truths that religions preach about mystery of humanity. and do much more. Religions are not only able to facilitate a greater presence of palliative care where it is needed, but they are one of the true component forces of palliative care itself. Total attention to the person is made much more difficult by economic hegemonies that colonize contemporary cultures and societies. The result of this situation can be only a culture, or rather anti-culture, of wastefulness. An understanding of human existence and of reality that values religious experience allows us to see and affirm a good that surpasses and is not limited by economic calculus. Recognition of the integral openness of the person to transcendence makes it possible to state that in human life, even when it is fragile and seems to be defeated by illness, there is inalienable value. Palliative care represents a vision of man that is preached and protected by the great religious traditions. In terms of motivation and inspiration, this is the most profound and trenchant contribution palliative care can receive. Palliative care today represents for all of us a concrete initiative within a climate of vanishing love for humanity and a crisis of social ties that beginning with a generic disengagement is now reaching a real social disintegration that involves all social structures, beginning with the family. Societas as a communion of persons, no matter what form it takes, is necessary for self-realization of the individual. While the individual is not the servant of society, society is not merely an instrument for the self-realization of the individual. It is rather a condition that allows for the such realization. It is difficult to make what is human develop in a society where relationships are mummified. The ego, as it is more and more conceived of by postmodernity, becomes an force for dissolution, not for bonding; exclusion, not inclusion; fluidity, not consolidation. It is therefore essential to foster not only problem-solving, which can be superficial, but also the lasting dream of a new humanism for all, and of universal brotherhood. Reinventing a new brotherhood is the anthropological and social challenge of our day and is the specific charge that Pope Francis gave to the Pontifical Academy for Life on the occasion of the twenty-fifth anniversary of its creation, which will be celebrated on February eleventh. The text of the Holy Father’s letter is in your folders. Here too, religions have a very special word to say. are perceived as obstacles or no longer useful. The palliative care community bears witness to a new way of living that focuses on the person and his good, to which not only the individual but the whole community tends. In this community the good of each person is pursued as a good that benefits everyone. Palliative care is a human right, and various international programs are working to implement it; but the basic human right is to continue to be recognized and accepted as a member of society, as part of a community. 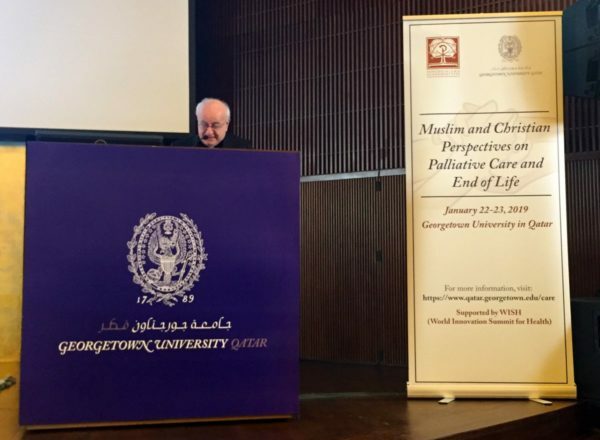 The Conference which we are about to begin will open with the signing, by me and Sultana Afdhal, of a Joint Declaration on the End of Life and Palliative Care, issued by WISH and the Pontifical Academy for Life, two institutions of different faiths, but sharing the task of study, scientific advancement and cultural development; two academic institutions that specifically in palliative care find a fruitful ground for encounter and cooperation in order to reach a new humanism for the benefit of all persons and all peoples. In this context I would like to express my appreciation for the scientific and cultural contribution that WISH has offered to the international community through its activities, not least for the work of the group on “Islamic Ethics and Palliative Care” led by Dr. Mohammed Ghaly, who presented its results during the Summit celebrated here in Doha last November. This was a valuable starting point for our work. I hope that these two days can make an effective contribution to making palliative care—which is called on every day to face great challenges in accompanying the dying—more well-known and fully accepted by public opinion, and can give rise to a fruitful new humanism for the benefit of all. I am sure that we can work together effectively and learn much from each other. I wish everyone a very profitable two days.